Have you tried a stacking toy with your little one? They are very popular but most stacking toys given to children look a little like this or like this, with graduated rings. There is a simpler stacking toy to start with, that can be used by the sitting infant to help them develop concentration and coordination, it's the First Stacking Toy with Rings like those pictured above. You can present it with one to three rings. To start, make the rings the same size and fairly large. Once the child has mastered it you can present the same toy but with smaller rings. The good news is if you have a more complex stacking toy like the ones with graduated rings this is easy to DIY. Just remove the existing rings and add some nice sized wooden rings. If your child is like Otto they can also enjoy chewing on the rings (this seems like a peak time for teething) which is completely ok, there are no safety concerns with small parts or paint if using natural wood rings. All of the first stacking toys pictured above are suitable for this stage in development. Stacking Rings at Mama May I. 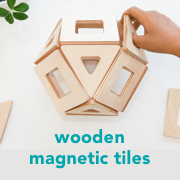 Wooden Stacker Toy at Essential Montessori. 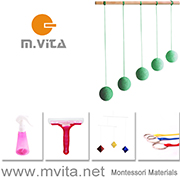 Ring Stacker Set (Montessori 4 in 1 Baby Toy) at Beginning Montessori. - This one is great value as it can be used through the various levels. Montessori Infant Ring Stacking Work Level 1 at Hodges Grocery Studio - This one isn't currently available but I've shown it as it is a good example. Our first stacking toy is made from the Discs on a Vertical Dowel (c/o Montessori Shop). I removed the discs (for the time being) and we are using three wooden rings. Otto (as pictured) is using this at nine months and it's one of his most used materials along with his Object Permanence Box. Pictured below is Otis at 11 months successfully using napkin rings on the dowel, this stacker is a part of the set at Beginning Montessori. Sometimes I am asked why. To improve concentration and problem solving skills. To stimulate and strengthen the hand. To create good work habits. To extend and challenge the child. For a keeping it real moment. What I'm sure every child does with the cup. As a side note Otis is now drinking from his cup with one hand all of the time. I think it's a true sign that he is observing us and following our lead.